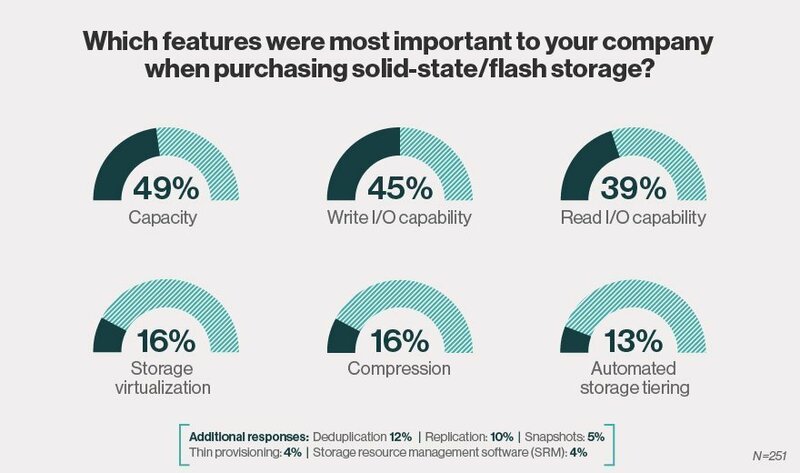 We asked survey respondents to identify the most important features when purchasing solid-state/flash storage technology. At 49%, solid-state/flash storage capacity ranked highest among the various product attributes. Deduplication and compression capabilities -- both were selected by respondents as important product features -- allow organizations to pack more data into less space. "Now, there's no reason a hard drive-based system couldn't use the deduplication and compression technically. The problem is there could be a performance issue, because now [you're] adding even more random I/O, as [you] try to figure out what [data] is unique and things like that," Crump said. When compared with hard drives, flash is denser technology, with more raw capacity in less space. Customers can also run at higher percentages of capacity with flash than they can from hard drives. "In a flash environment, there's no penalty for running at very high levels of utilization. So, where in a hardware environment, [you] might run at 20% of capacity, in a flash environment, it wouldn't be uncommon for [you] to run at 70% of capacity," he said. Other important features that Crump noted included a system that is optimized to complement the performance capabilities of the flash storage itself. "[The system] needs to have a good design, so the data itself doesn't become a bottleneck to the performance of the system." Additionally, quality of service, he said, is becoming an important feature in hybrid arrays, as well as all-flash arrays. After solid-state/flash storage capacity, next in line for important product features was the capability of writing I/O, cited by 45% of respondents. This was followed by the capability of reading I/O, cited by 39%. What solid-state/flash features do your clients generally ask about?